Rosanne Cash’s conceit is that one has to look outward to see what’s inside. The public landmarks just serve as reminders of one’s private thoughts. 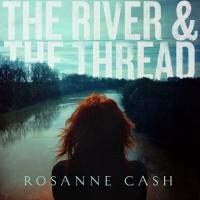 Although Rosanne Cash’s latest album contains only 11 songs and lasts just under 40 minutes, the singer songwriter makes you feel you have taken a long journey. It’s a road album, where sometimes the driver leaves the blacktop and takes the rocky gravel path to see what’s there. Cash’s conceit is that one has to look outward to see what’s inside. The public landmarks just serve as reminders of one’s private thoughts. The songs on The River and the Thread are all set in the mythic American South—that gothic place where the blues, country, gospel, and rock all emerged. The strange thing is that the music seems pure by not being anything pure in particular. Cash said that she wrote the lyrics while her husband John Leventhal composed the tunes. The two co-produced the album. Sometimes Cash is a little wordy and other times Leventhal’s melodies kind of drift off, but mostly the two mesh together well. They understand what each other is doing, so that on a track such as “World of Strange Design”, the shuffle beat allows Cash to pile the words on top of each other for full dramatic effect. “If Jesus came from Mississippi," she wails, while Leventhal lets his fingers creep over the strings so that the importance of what this suggests comes through. The implication is that while some of the region’s more notable musicians like Robert Johnson, thought the devil lived nearby—what if that was only an optimistic wish. The truth is that even Jesus couldn’t save or damn the place any more if he came from there. While the South Cash invokes is more than land of her father and her ancestors than hers, it really doesn’t matter because she is really writing about herself. The Jesus she sings about on the aforementioned cut is really the spirit inside her, and the unmentioned devil her hidden side. Identifying oneself with a geographic place, especially one as opulently symbolic as the American South, is nothing new or unusual. What’s different and special is the way Cash can take commonplace allusions like “The Long Way Home” and “When the Master Calls the Roll” into something specific and detailed. The last song is especially rich. The ballad concerns a woman whose husband dies in the Civil War with a “With my father’s rifle in one hand / And your locket in the other." A chorus of Kris Kristofferson, John Prine, Tony Joe White, Amy Helm, and Rodney Crowell joins Cash as she laments death, war, and the pain of love—and more grandly, a time when the nation becomes whole again. Anyone familiar with the state of polarized politics in America cannot miss the allusion to the present day made by recalling the past. Think of Bobbie Gentry’s 1967 hit “Ode to Billie Joe” as a song that used a similar strategy. It concerned the mysterious death of a young man to the relative indifference of those that knew him. Critic Greil Marcus has convincingly proved that the song’s subtext had much more to do with Americans ignoring the tragedy of the Vietnam War than with the particulars of the song. Cash cites Gentry’s song. She begins “Money Road” with “I was dreaming about the Tallahatchie Bridge” and proceeds to tell the story of a soldier in a foreign land (among other things). “You can cross the bridge," Cash informs the listener, “but the river stays the same.” That may be, but Cash takes the high road and leaves the river behind.